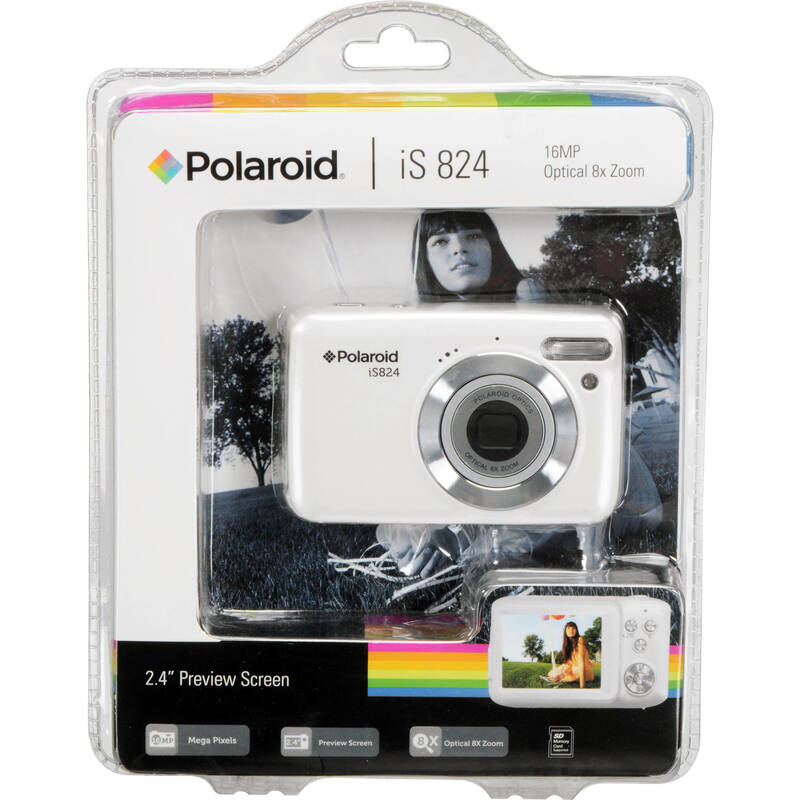 The white Polaroid iS824 Digital Camera features a 16MP sensor for capturing high-resolution digital images or 1080p video which can be viewed on its 2.4" rear display. An 8x optical zoom lens allows you to get closer to your subject, and a built-in flash is included for use in low-light. Tools such as auto-flash, red eye reduction, image stabilization, and a self-timer help make taking portraits, self-portraits, and group shots easy, while helping your subjects look their best. Images and videos are saved to a Class 4 or greater SD card, which can then be downloaded to a computer using the included USB cable and Polaroid Instant Memories software. The software can be used to edit, organize, and upload your images or videos to sharing and social media sites. This compact camera is powered by three separately-available AAA batteries. Box Dimensions (LxWxH) 8.0 x 6.9 x 1.3"
iS824 Digital Camera (White) is rated 2.8 out of 5 by 4. Rated 3 out of 5 by Anonymous from Cute little camera The photos taken with this camera are not the best quality, so if you're looking for a serious digital camera this is not the one for you. But if you want to buy a small easy to use digital camera for a child this one is perfect! Rated 1 out of 5 by Mark Robbins from Save Your Money!!! The old adage you get what you pay for couldn't be more true regarding this Polaroid Digital Camera. I bought 2 for my grandsons thinking it would be a good starter camera. Wrong! The battery door hardly stays closed and that's after struggling to get it closed. The camera turns itself on, we finally had to remove the batteries to keep the camera off. The shutter button requires some effort to depress enough to take a photo. All in all this is really a shoddy piece of equipment and the only reason it merited one star is because it has a decent strap. Rated 2 out of 5 by emiko from can not turn on. The power supply will not turn on unless the battery contact is bad or you need to hold down the battery lid strongly. not good. How do you take a video on it? You would select the video setting from within the menu then utilize the center ok button to activate and stop recording. I am having trouble turning the camera off. How do I turn it off? To turn the camera off, press the power button. Please email us directly at photo@&lt;a href= http://bhphoto.com target= _blank &gt;bhphoto.com&lt;/a&gt; with the issues you're experiencing so we can best assist you. What's the button to see the pictures you've taken? As stated in the Polaroid iS824 Digital Camera's instruction manual on page 9, to access the Playback Mode, after turning on your camera, press the MODE button twice to open the Playback Mode for photos and videos. You can scroll through the photos and videos that you've previously taken to view, edit, or delete them as desired. To access the various menus for the Playback Mode for photos and videos, press the SET button while in the Playback Mode. How do you take the memory card out? To remove the memory card, press down on the card, and it should pop up out of the camera for removal. This camera does not have a mic. I messed up my camera. Now it won't stay on, but the lens will keep going in and out and the red light blinks. Can I fix it? If so, how? I would suggest contacting the manufacturer in regard to your inquiry. how to use the disc in the computer? cause its not working.